Greetings from the Bradenton Farmers’ Market! We’re taking over FMC’s Instagram this week to share with you a look into our market. The market is loved by our community, and for good reason! As a new “visitor”, there are a few things you ought to know to fully appreciate the market that surrounds you. 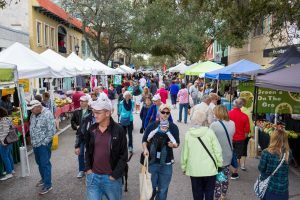 The Bradenton Farmers’ Market, located on Old Main Street in downtown Bradenton, has been around for a long time. In fact, some of our vendors have been participating since the beginning. Sheppard Farms, one of the oldest farms in the state of Florida, has been participating for more than 20 years. Since 2010, Realize Bradenton, a nonprofit organization that promotes redevelopment and economic growth in downtown Bradenton, has been managing the Market. We are proud of the growth in the number of vendors, attendees and programs implemented at our Market since then. Are you one of those folks who has discovered our Market on social media: Facebook or Instagram – #bradentonfarmersmarket, or our website, or Realize Bradenton’s Events Page? Perhaps you know about us through our community outreach, or because you have seen our signs and banners posted throughout the downtown area. If you know about us, but haven’t yet visited, all we can say is – What are you waiting for? You can visit our Market on Saturdays, from 9 am to 2 pm, from the beginning of October through the end of May. On any given Saturday, we have 35 or more vendors selling produce, a variety locally produced food, and home goods. You can also count on market happenings– demonstrations by local chefs, live music, and crafts for kids every week. In addition to all that, the Junior League of Manatee County brings us Kids in the Kitchen on the 4th Saturday of each month, and throughout the month, we have a number of healthy lifestyle activities for the whole family, brought to us by our partners at the FL Dept. of Health in Manatee County, the UF/IFAS Family Nutrition Program and Master Gardeners, and the Central Library. All of that is complimented by Mainly Art, an arts and crafts market held on the third Saturday of each month. Besides being a great venue for established artists and crafters, Mainly Art is also a venue where folks have the unique opportunity to grow from being hobbyists to becoming professionals. Exciting April events include health fair with the Florida Department of Health in Manatee County and Tobacco Free Florida on April 7th. Beats @ Healthy Street includes free health screenings, cooking demos, activity demonstrations and exhibits, and coincides with the observance of National Public Health Week. Then on April 14th, we are having our Children’s Book Fair and Family Fun Day featuring a dozen local children’s authors and fun family activities provided by our community partners and built around the theme, How does your food grow? One of the things we are most proud of is our role in providing greater access to fresh fruits and vegetables, and locally produced healthy foods. Our Market accepts SNAP (Supplemental Nutrition Access Program) cards, and we have set up a system with “market bucks” that makes shopping with SNAP a breeze for both our customers and our vendors. But even more importantly, we are also partnering with Florida Organic Growers as a part of the FAB (Fresh Access Bucks) network. As members of FAB, we offer a match of up to $40 of your SNAP purchase for the purchase of Florida grown produce. Offering this incentive gives families an amazing opportunity to add fresh fruit and veggies to their diet without added costs. Making sure that everyone in our community knows about this fantastic opportunity, coupled with our programs and activities built around developing a healthy lifestyle can be challenging, but with the help of our community partners and our ongoing efforts to reach out to our neighbors, we are enjoying greater success all the time. As a growing market in an area that is experiencing revitalization and greater connectivity with all our neighbors, and with a strong desire to engage people of all ages in health, wellness and creativity, we are excited to support our local growers, producers of locally made goods and creative businesses by serving as a conduit for increased access to healthy food and an incubator for small businesses in our community. We are so excited to take over FMC’s Instagram account because we love what we do and think you will, too!